Clicking on each photo will bring up a much higher resolution version of the picture. Also note that this blog is configured so that all 8 posts load up on the home page, so to see all the photos just make sure that you're on the home page and scroll down. And as well as all these postings, there are also 5 posts (1, 2, 3, 4, 5) on my main blog which mention the holiday :-). I took the seven pictures below from the window of the plane on the second leg of my outbound journey, between São Paulo and Santiago in Chile. Can anyone tell me what's going on in the pic below? What on earth are all those circles on the ground? The picture was taken after we'd crossed the Laguna de Mar Chiquita near Córdoba, but before we reached the Andes. Palacio de La Moneda, photographed from Plaza de la Constitución. This is the presidential palace, and was the site of the 1973 Pinochet-led coup that ousted Salvador Allende. It's not white paint that's made that rock white, but the sea lions on the bottom left don't seem to mind :-). Our guide said that they call it the 'Michael Jackson' rock, but that's probably just a joke for us tourists! The Atacama desert is meant to be the driest place on Earth, but that didn't stop it raining while we were there! Apparently it was the first time that it had rained in 6 years and consequently all the locals were ecstatic, but as Londoner I wasn't so impressed. If you can't escape the dreary rainy British weather by visiting the driest place on earth, climate change really has gone too far! A lightening storm in the driest place on earth brings more rain! The Altiplano (Spanish for high plain), where the Andes are at their widest, is the most extensive area of high plateau on earth outside of Tibet. Nice place for a picnic? Well, it was until it started raining! 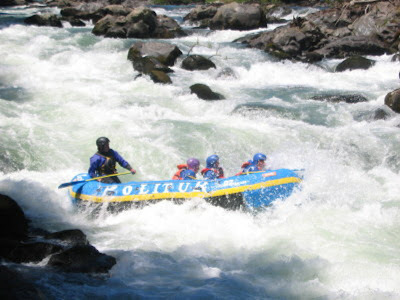 GB rafting on the upper Trancura river near Pucón. I'm the one with the purple helmet! After 12 days in Chile, we headed across the Andes to San Carlos de Bariloche in Argentina, for a couple of nights in a hotel near Villa La Angostura. Hilltop view onto Lago Nahuel Huapi. Our guide described the small waterway that connects the two sections of the lake in the top and bottom parts of the picture as "The smallest river in the world". One of the activities that we did while in this area was the Canopy Adventure Tour. 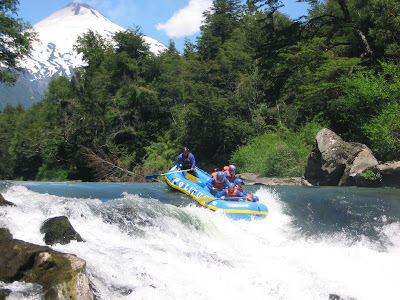 There seem to be various location where it's possible to do this in the region, so we did it near Villa La Angostura rather than at Bariloche. Highly recommended :-).